Browse: Home / PTZ : Penetration Tester’s Zsh – functions for fast pawn. PTZ is a Penetration Tester’s Zsh with functions 4 fast pawn. Works on Debian if the dependencies are met or on Kali. Probably works on Pentoo also. 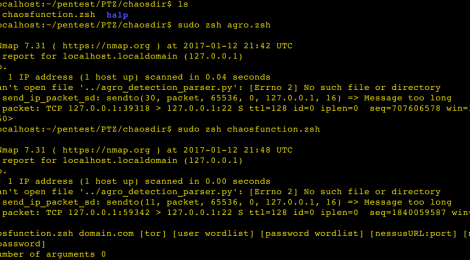 * Offensive part: theharvester nmap fierce dnsrecon dnsutils hydra dirb sqlmap wget dirb curl nikto libxml2-utils whatweb. ← Vuurmuur – is a powerful firewall manager built on top of ​iptables on Linux.